Sneak Movie Preview; Walked out! I give it two thumbs down!! 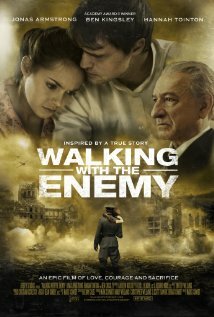 Attended the sneak preview this evening of “Walking with the Enemy.” The movie is Directed by Mark Schmidt. Stars: Jonas Armstrong, Ben Kingsley, Hanna Tointon and more. Synopsis: Takes place during WWII in Hungary and supposedly a film “inspired by a true story (I don’t know about that) of a young man who is separated from his family in Hungary during WWII. I can only say the acting in this film seemed very forced, the actors seemed inexperienced and the movie lacked dialogue. This movie will open in theatres within the next day or two. I do not recommend this film.